Church in the 90’s was all about one thing: looking the part. Guys all wore the same polo shirt tucked into the same pair of khakis and girls all wore the same dresses. We answered every “God is good” statement with “all the time” and pretended it wasn’t the cheesiest thing in the world. We’d sing the same songs each week all while trying not to laugh at the old lady who brought her own tambourine. Then, after shaking hands with Mr. Smith who remembers when we were “this” big, we’d sit down to listen to the same sermon about hell fire, brimstone, and not sinning. And not listening to Metallica. Whatever you do, don’t listen to Metallica. There’s no Heaven in your future if you listen to Metallica. Eventually we all left the church because it was all about rules and felt superficial. Mr. Smith looked and said the right things at church but then he’d treat his business clients like dirt and drink a little too much on Friday night. It all felt hypocritical. Like everything was a performance. Like a fashion trend making its way east from California, we learned of this piece of Christianity we didn’t know existed. It was new and different. It felt warm and comfortable. Grace brought us back. It showed us that church and Christianity were more about a relationship than a set of rules. It let us know we didn’t have to have it all together and it was okay to not be perfect. We could even wear jeans to church and God wouldn’t think less of us. We could listen to them if we wanted, but by now we’d grown up and realized they weren’t that great so why would we want to? Grace turned us on to being better people. Unlike church in the 90’s, church with grace called us to more in a way that made us actually want whatever more was. It made us want to seek after God because we knew if we messed up, we didn’t have to start over. As we learned more about this grace idea, we learned that nothing could separate us from God. We learned the rules of the 90’s were “legalistic” and didn’t apply as much as we were taught. God judges our heart, not our actions, so as long as our heart is in the right place, we’re okay. Want to go out and drink a little too much? No problem. We’ve got grace. Want to live with your boyfriend before you’re married? No biggie. Grace can cover that. Want to be a jerk to your annoying name? Grace makes that okay too! 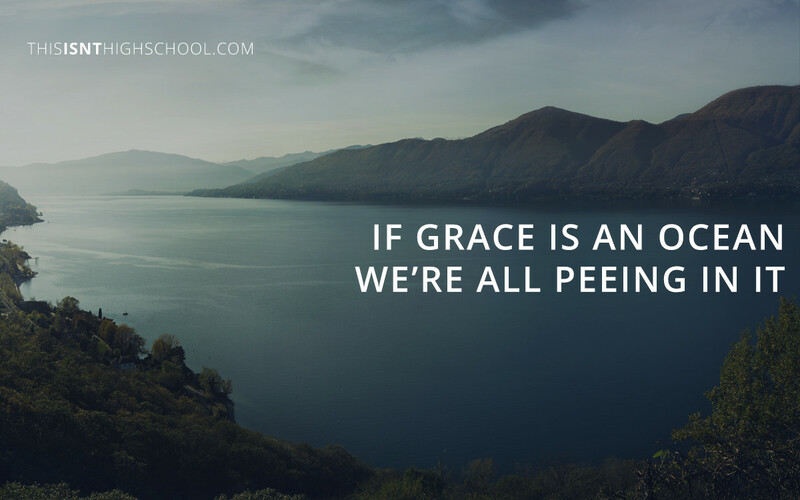 We let the pendulum swing so far opposite of legalism that we began peeing in the ocean of grace. Somewhere along the line we let the pendulum swing so far opposite of legalism and rules that we began peeing in the ocean of grace. We started taking advantage of the free gift we’ve been given. What was originally meant as an escape hatch has now been turned into the front door. Grace was given because none of us could ever match the holiness of God. No matter how hard we tried – how many rules we followed – we’d never be able to reach the standard set before us. Knowing we could never keep the standard, God sent Jesus to be brutally murdered so we could have a chance. Without that execution, we’d have no shot being who we’re called to be. God was murdered to give us a gift. When we use that gift for our benefit, we become no different than the Roman soldiers vying for Jesus’ clothes. Have you been taking advantage of grace? Have you been using an execution for your enjoyment? The beauty of grace is that, even when we use it for our comfort, it’s still available for us to use the right way. No matter how far you’ve let the pendulum swing, it can always come back to the middle where Jesus is. God’s grace is such a giant ocean that it isn’t overtaken by a few warm spots here and there. How do you need that ocean today? What’s holding you back from doing it?